Numerous studies repeatedly show that circulating NE levels and urinary NE excretion are elevated in OSA (Carlson et al. 1993; Dimsdale et al. 1995; Eisensehr et al. 1998). Typical values are shown in Fig. 15.1. In our studies over the years, we have defined OSA as the presence of a respiratory disturbance index (RDI) of >20 or, in more recent studies, an apnea hypopnia index (AHI) >15. RDI is the frequency of abnormal respiratory events per hour of sleep. AHI is defined as the total number of apneas (brief pauses in breathing) and hypopneas (reductions in airflow) per hour of sleep. A reasonable question to pose is "What is the source of sympathetic nervous system activation in OSA?" Is it a response to the respiratory disturbance itself, the o. Figure 15.1. 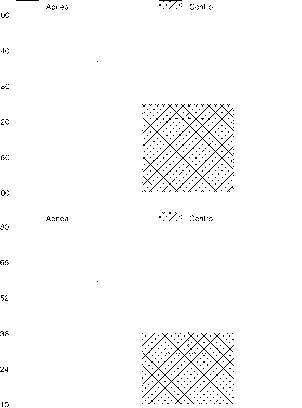 Plasma NE levels (p < 0.01) (top) and 24-h NE excretion (p < 0.01) (bottom) are elevated in OSA (Dimsdale, Coy, Ancoli-Israel, Mills, Clausen, and Ziegler 1997; Ziegler, Nelesen, Mills, Ancoli-Israel, Kennedy, and Dimsdale 1997). resulting hypoxia, or the repeated disruption of sleep? We examined this question and found that 24-h NE excretion correlated with RDI (r = 0.39, p < 0.01) and with mean oxygen saturation (r = -0.36, p < 0.05) (Dimsdale et al. 1997). In a multiple regression model, these variables, together with amount of time spent in slow-wave sleep, accounted for a statistically significant (but modest percentage) of the variance in NE excretion (R2 = 0.19, p < 0.05). Other studies examining this issue find evidence that the repeated hypoxia and sleep disturbance cause sympathetic activation and a subsequent increase in blood pressure. 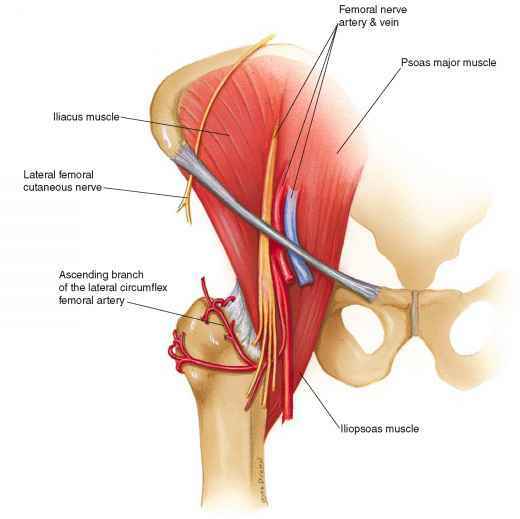 In a study of healthy subjects who performed voluntary end-expiratory (hypoxic) apneas, muscle sympathetic nerve activity (MSNA via peroneal microneurography) and blood pressure increased significantly and remained elevated (Leuenberger, Brubaker, Quraishi, Hogeman, Imadojemu, and Gray 2005). In subjects who had performed repetitive non-end-expiratory apneas, MSNA and blood pressure did not change. Thus, in this study, it was the repetitive end-expiratory hypoxic apneas that resulted in sustained sympathetic activation. Another study found that the degree of arousal in OSA was more significantly correlated with increased blood pressure than oxygen saturation (Yoon and Jeong 2001). Respiratory disturbance duration, on the other hand, was not related to the increase in blood pressure. The authors concluded that it is the degree of arousal, not hypoxia, that causes sympathetic activation in OSA. Thus, studies of diverse designs indicate that respiratory disturbance and hypoxia contribute to sympathetic activation in OSA. NE exerts its physiological effects via P- and a-adrenergic receptors. We have used both in vitro and in vivo techniques to assess the effects of elevated circulating NE levels in OSA on adrenergic receptors. We have shown that as a result of elevated NE levels, individuals with OSA exhibit decreased lymphocyte P2-adrenergic receptor sensitivity (Mills et al. 1995) (Fig. 15.2). Lymphocytes are often used as in vitro models of the P2-adrenergic receptor because lymphocyte P2-adrenergic receptors correlate well with P2-adrenergic receptors on tissue such as the heart and lung (Brodde, Michel, Gordon, Sandoval, Gilbert, and Bristow 1989). In this in vitro technique, lymphocytes are isolated from whole blood and stimulated with a maximal dose of isoproterenol. P2-Adrenergic receptor sensitivity is inferred from the amount of isoproterenol-stimulated cyclic AMP generated by the cell over nonstimulated levels. An in vivo technique for assessing the Pr and P2-adrenergic receptors involves intravenously infusing incremental doses of isoproterenol (0.10, 0.25, 0.50, 1.0, 2.0, and 4.0 ^g), measuring the resultant heart rate, and inferring the dose necessary to increase heart rate by 25 beats/min; this dose is termed the "Chronotropic 25 Dose" (CD25) (Mills et al. 1998). We infused isoproterenol in a group of apneics and nonapneic controls while the subject was supine and while breathing room air. OSA patients had a higher CD25 than nonapneics, meaning it took more isoproterenol to increase their heart rate, equating to reduced cardiac P-adrenergic receptor sensitivity (Fig. 15.2). Figure 15.2. 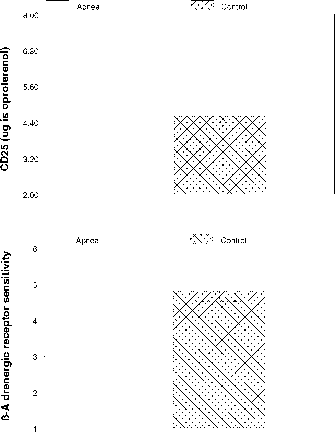 Lymphocyte P2-adrenergic receptors are desensitized in OSA (p < 0.01) (top). CD25 is increased in OSA (p < 0.01) (bottom) indicating reduced cardiac p-adrenergic receptor sensitivity (Mills et al. 1995; Mills et al. 1998). We concluded from these observations that adrenergic activation and repeated hypoxic events in apnea lead to P-adrenergic receptor desensitization in OSA. In addition to the effects of catecholamines, there is a considerable literature on the effects of hypoxia on the P-adrenergic receptor. Studies on the effects of ischemia on cardiac Pr and P2-adrenergic receptors, for example, show that hypoxia down-regulates ventricular P-adrenergic receptors approximately 50% (Marsh and Sweeney 1989; Bernstein, Doshi, Huang, Strandness, and Jasper 1992). Based on this literature and the hypoxia typical of OSA, we extended our P2-adrenergic receptor studies to examine the effects of hypoxia on P-adrenergic receptor sensitivity in OSA. We determined the CD25 while subjects breathed either room air (21% O2, 79% N2) or a hypoxic gas mixture5 (15% O2, 85% N2) for 10 min and then during the isoproterenol infusion protocol, which took approximately 25 min (Mills et al. 1998). Under normoxic conditions, apnea patients showed a significantly higher CD25 (lower P-adrenergic receptor sensitivity) as compared to controls. In response to hypoxia, apnea patients showed no change in CD25 while controls showed a significant increase in CD25 (P-adrenergic receptor desensitization) from 4.6 ^g to a value comparable to the apneics (5.8 ^g) (p < 0.01) (Fig. 15.2).